If you’ve been reading my blog this month then you’ll know that I have visited the amazing Selfridges Beauty Hall in the Trafford Centre in Manchester. If you’re needing to catch up then check out this post. I have been trying out some services that are available at the various different beauty counters so that I could report back and let you all know how I got on at them. You can read about my skincare experience at Kiehl’s here and see the gorgeous Express Manicure that I had done at Nails Inc here. 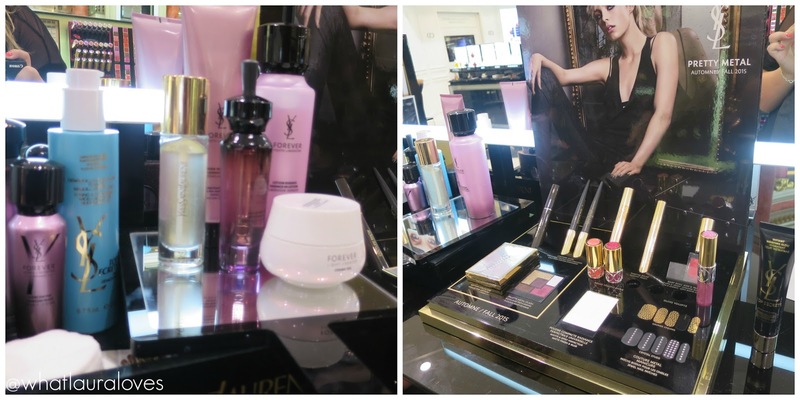 The last stop in my Selfridges Beauty Hall experience was the YSL counter. I’ve loved YSL for years, their Elle perfume was the fragrance I wore on my first date with my hubby and I have worn their makeup ever since I was in my teens when I first started experimenting with makeup. At the counter, I was greeted by Rebecca who was clearly so incredibly passionate about her job and YSL as she was so knowledgeable about the brand and a real credit to Selfridges. Plus she had a great Scouse accent that I couldn’t help copying! If you know me in real life then you’ll know that I LOVE the Liverpool accent, it is my absolute favourite accent so I could have sat listening to Rebecca talk for hours! It was so refreshing to sit down and talk beauty with someone who was excited about it as me. Rebecca started by taking me through a selection of the vast YSL skincare line with a focus on the Youth Liberator line before moving onto makeup with a specific focus on the new autumn releases. I’ve used a lot of YSL makeup in the past but never their skincare and I was very pleasantly surprised to discover just how fabulous it is. Having been developed with over 100 years of research by top scientists, YSL has 7 Nobel Prizes behind their skincare range. Since I had already had a facial from Kiehl’s Rebecca focused on applying the majority of the skincare to the back of my hand so that I could feel the texture and see the difference for myself, so as not to overload my skin. The Forever Youth line contains an innovative ingredient that contains a combination of glycans called Glycanactif which unlock the cells in the skin to reactivate their vital functions and liberate the youth potential at all levels of the skin. This ingredient is particularly key to the success of the Forever Youth line as the majority of skincare products only work on the surface layers of the skin whereas this aims to work deep down with has a longer lasting effect. The discovery of the revolutionary glycobiology has been deemed to be one of the ten fields of science that will change the future of medicine so YSL being an exclusive beneficiary of this technology is pretty amazing stuff. The YSL Forever Youth Liberator Cleanser was the first product that I tried out and it just goes to show you that you should really try products out before dismissing them as this is described as a foam which I would have usually not gone for, thinking that it would be stripping and drying on the skin but it isn’t at all. It actually feels really creamy and gentle on the skin. My favourite of all of the skincare products have to be the YSL Forever Youth Liberator Essence-in-Lotion which has an oil in water formula and the serum which are both incredibly light on the skin and leave it feeling plumped up, hydrated and like velvet to the touch. They smell absolutely incredibly good too! After looking at skincare we moved onto makeup, specifically the products that have been launched for the autumn/fall 2015 season, including the gorgeous eyeshadows from the Pretty Metal collection that are on my lids in the below photo. This collection combines the kind of highly pigmented, seasonal colours that you love from YSL with absolutely stunning packaging that anyone would feel a little smug pulling out of their handbag. The YSL Metal Clash eyeshadow palette combines a deep plum, pale lilac, chocolatey brown and a dirty burgundy with the most gorgeous metallic gold that will set off any eyeshadow look this season. All 5 shades are super pigmented and look superb whether they’re worn alone, together or with other eyeshadows to create a different look entirely. There’s also a fabulous compact mattifying powder in the collection which managed to mattify even my oily skin without leaving it looking flat, dull or cakey. It is completely translucent on the skin, making it suitable for any skintone to use and Rebecca explained to me that because it isn’t heavy, it can be used to set the makeup of those with super dry or oily skin and everyone in between. There are plenty of lip products in the collection as well as some more eye products including the YSL Couture Kajal Pencils. These are a great multi purpose release as they can be used as liners or as eyeshadows to create a super smokey look that is perfect for channelling your inner Cara Delevingne for the party season, especially when used with the YSL Couture Brow tinted eyebrow gels which give you a buildable amount of colour and a gel like hold that will ensure even the bushiest of brows will stay in place all night! I was happy to find out that some old favourites are still available from YSL and are as good as ever, such as the Touche Éclat which is fabulous for highlighting underneath the eyes. However I was most happy to find out that my favourite mascara from them, the Effet Faux Cils, has been reformulated to stop it from drying out quite so quickly, which was the only downside that I could find about the mascara when I’d tried it before. My favourite makeup product that I got to try out was the YSL Te Blur Perfector which comes in a gorgeous pink compact. This balm powder has received lots of recognition including an award for best powder of the year. It is a powder that acts like a priming balm. You can wear it alone or under or over makeup to smooth the skin, blur pores and imperfections and create a great base for makeup. Its a bit of a princess product but one that I think would be a great addition to my makeup bag! I really liked that Rebecca hand selected products that would not only work well for my skin type but that are a popular choice for a lot of different skin types so that I could give you all an overview rather than sticking to just things for oily skin. This showed that she really knew her stuff and I’d definitely recommend heading to the YSL counter if you’re looking for either high performing skincare or makeup. I must also recommend that you check out the Black Opium fragrance by YSL. I spritzed it on just before having my makeup done and it smelt so incredible, definitely one to add to the Christmas gift list! You’re able to book in for makeovers at the counter but if you’re just wanting to try a new lipstick and you’re unsure which colour to go for then just pop along and you’ll be able to swatch lots, perhaps try one on and decide there and then. Similarly, if you’re looking for a new foundation whether it be new in formula or if you’ve been on holiday and become more tanned or more pale now that its coming into the winter, then I’d highly suggested going along to a store to try out the products at the counter rather than just blindly buying online. Its always best to give a product like that a trial run first of all. The girls at the counter will be more than happy to help to match you up to your shade and if you’re unsure as to whether the foundation is right for you then you could even ask for a little sample pot to take away a couple of days worth of product to try yourself at home. This helps you to see how the foundation works with your other products, to see how it lasts on your skin and to check to see whether the shade is right for you. I have super oily skin so this is something that I do every time I buy a foundation for the first time and I always make sure to get the name of the person who has served me on the counter so that I can go back and purchase the product from them. It also means that if you have any follow up questions then you can direct them to that person too. 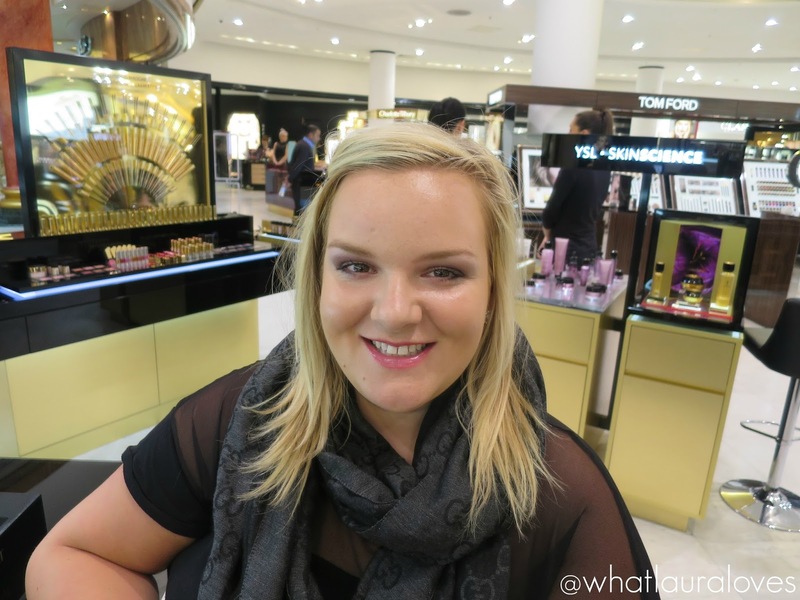 I thoroughly enjoyed my experience at the Selfridges Beauty Hall and especially at the YSL counter. I can’t wait until I am able to visit again! I bought a couple of lip products from YSL while I was there as I’m really enjoying making a feature of my lips at the moment. I’ll be reviewing those very soon on my blog so stay tuned for that! What is on your YSL makeup or skincare wishlist? I've never gone to one of these counters before, love the make-up they did on you! Black opium is a delicious scent. I remember my mother wearing the original opium in the 90's so have fond memories of the brand. I adore YSL makeup and agree that the forever youth products are so light, almost too light for my skin. I can't get enough of my Touche Eclat – definitely a daily necessity for me! Sounds like your makeover was lots of fun. Ooh I must try Effet Faux Cils! I really love Lancome's Hypnose but it's running out so will be looking to buy another soon – thanks! I really want to go to one of the make-up counters and try lots of different stuff out. I'm not one for makeup so nothing on my wishlist. Love Selfridges though stay far away from the makeup counters and perfume (too sensitive of a nose). Beautifully done make up though! I love visiting Selfridges, there is a lot to look at even if you are not buying. I love YSL, they're up there with my top 10 brands. I love your make over too, your lips look great. I love YSL I have bought a few things from them and they are always really helpful on the counters. I have never heard of this but it looks so fun. I love stopping at counters for try-outs though. I love the look of the metal clash purple eyeshadow it looks stunning on your eyes and your skin looks flawless as usual. I'm always so nervous about going to the beauty counters! 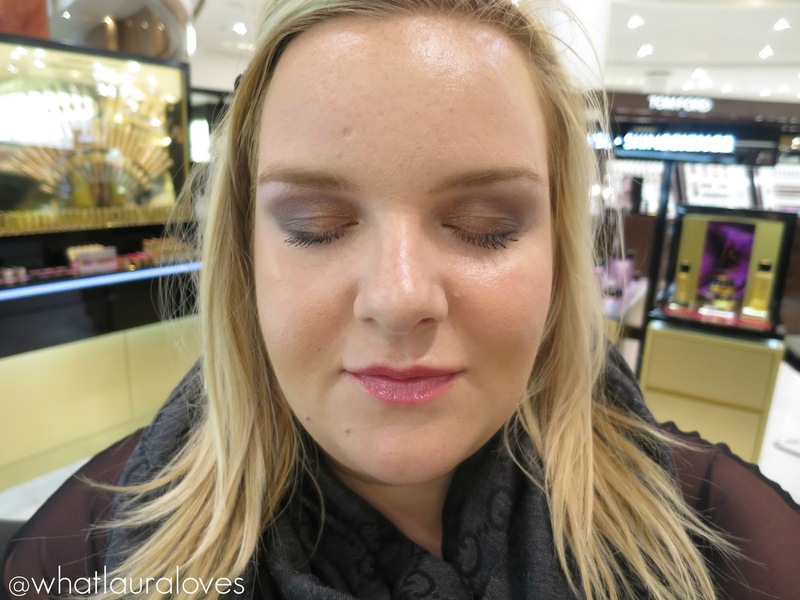 How lovely to have a YSL makeover! I've been lucky this year that I've gotten to try the YSL Effets Faux Cils mascara, the Blur Perfector (I love your description), the Blur Primer with the gold flecks and two of the lovely Rouge Pur Couture Lipsticks. I haven't tried any of the shadows, but seeing your gorgeous eye shadow look, I hope I'll get to try those next! I have never been to a beauty counter but I think I would really enjoy visiting one. I have put it on my bucket list! You look lovely by the way. Love YSL. I adore Selfridges (far more than Harrods). They've certainly done a fabulous, wearable look on you! I recently bought the YSL Fusion Ink foundation and am loving the lightweight, powdery finish.